In a followup interview about MAGIC Spell Studios at the Rochester Institute of Technology, Andy Phelps, founder and director of RIT's Center for Media, Arts, Games, Interaction and Creativity (MAGIC) and MAGIC Spell Studios discusses how to offer students real-world experience in digital media development and publishing — experience that's more than just "hands-on" because it's based on the newest technology innovation and trends. Mary Grush: I'm guessing that the construction of a new building — MAGIC Spell Studio's new home — is keeping you pretty busy. Are you still finding time for new media innovation and your explorations into the directions emerging media may be taking? Andy Phelps: Of course! Yes, we're knee-deep in the construction of the new building, but as always our initiatives and projects continuously present interesting developments that bubble to the surface of our attention. Grush: What's particularly striking now? Phelps: A lot of our work has historically been in games, but we're increasingly focused on the fusion of games — and other interactive environments, like virtual reality — with digital media of various forms. 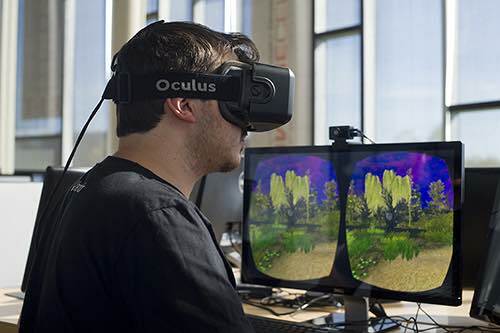 One of the great case examples right now can be found in virtual reality. When we did the launch event for our new construction, our students made an app that allows visitors to wander through the new building… before it's built, of course. We turned one of our faculty affiliates loose on the app to offer several different designs, presented using various media elements. I realize that VR is often used in design, but in this case our VR example clearly illustrated the tension and synergy, where technology is bringing together many forms and types of media engagement (video, film, interactive training simulations, and more — all have a place in VR and in games). We are being approached by all the different constituencies representing these various media. But we know that the core element, and what is important here, is not the attraction of any single media, but instead the discovery of new means to create compelling content — new platforms, new opportunities, and new affordances based on this fusion of interactive environments with diverse digital media. Grush: Where will you place your efforts, with so many new things going on? Phelps: Our job becomes the exploration of the space I just described, and its utility. For example, when considering a new gaming platform or VR environment we might ask: How do we tell stories with this? There are several efforts going on to examine how technologies like VR and gaming can impact the education process — the storytelling in any given field — particularly with the inclusion of numerous forms of new media. We are often in unexplored territory, and at the MAGIC Center we're comfortable with that. We continue to get our feet wet in new horizons, all the time. Grush: It sounds like when the MAGIC Center does its work, it's not just providing students with "hands-on experience" of a well-known, proven technology, but it's more geared toward opening up entirely new possibilities. Do the students explore uncharted waters with you? If so, how does that fit in with the standard education programs that the university offers? Phelps: The MAGIC Center is an innovation unit situated at a modern university. As such, we are always trying to step up and do things that the university does not yet do. This means we find new modalities and new ways of working, and we — including students — explore areas not yet explored. When we do something that has enough success demonstrated on campus and associated with it that it becomes part of the university culture — it becomes the norm — then we know we have reached a milestone and we've opened up new possibilities for those education programs you asked about. Grush: So you are specifically looking to change the ways your university works? Phelps: Yes, in that we are trying to challenge our assumptions about the ways people work, and the ways universities work. We try to look at these things from a new perspective and eventually bring the best of what we learn back to the normal apparatus of the university. Grush: You mentioned in an earlier interview with us that the MAGIC Center cuts across departments, organizations, and disciplines within the university. That would seem to give you a lot of latitude in terms of working with the people, departments, and organizations you wish to — anyone within the university. Are there particular organizational units within RIT that you might consider your major partners? Phelps: Of course I can name several strong partners here at RIT. We do a lot of work with the Simone Center for Student Innovation and Entrepreneurship, the Venture Creations Incubator, the School of Interactive Games and Media (within the Golisano College for Computing and Information Sciences), and the School of Film and Animation (in the College of Imaging Arts and Sciences). There is a program within Digital Humanities that we do a fair amount of work with, as we do with the School for Individualized Studies… Remember, we are set up on this model of cutting across the university, and we often work with several groups as interests align around a given topic or exploration. Grush: But what about how MAGIC's work impacts long-established academic programs and their curricula? Phelps: There is one thing we do that has challenged the campus most — in good ways. RIT has always been very good at delivering the curriculum and the programs we offer. And so, traditionally, that's been a mainstay of success for the university. There is a very applied, hands-on, project-driven curriculum here that helps prepare students first for co-op work, and then for full-time employment. We have been very successful with that, both at the undergraduate level, and even in the professional/master's area. But one of the things that we've done with MAGIC, is that the MAGIC Center does not itself offer a curriculum. You can't take a course in what we do; you can't get a degree or a major in it. When we step back and think about a student coming to a university, the courses are an important part of that, but not the totality of the experience. If you and I were to think back on everything we learned in college and how we learned it, I'm sure we'd remember a lot of things we learned not in classes. MAGIC operates at that level, from the student perspective. So it has challenged the campus in a good way, to help us think about or rethink what we mean by the "student experience"… or the "RIT experience". Grush: All that would seem to place more responsibility on students to engineer their own type of engagement with the MAGIC Center and MAGIC Spell Studios. At RIT, I would guess that most students are able to master both learning environments — the structured curriculum or course work and the more unstructured opportunities and resources they have at the MAGIC Center. But do you provide guidance for them in that process? What's the key, given this environment, to help them build a better foundation for their upcoming entry into the "real world"? Phelps: To characterize it broadly, I think that one of the keys is the mentorship coupled with these experiences. Think about a fictional student, for a moment, who goes to all their classes, gets great grades, but never pushes beyond that. I think this imagined student would not be hugely successful in his or her field. By contrast, the students who will become successful down the road are the ones who discover an appealing project at the MAGIC Center and tinker, and bend it to the extent that they come up with something that no one expected. That's what success looks like in this field, in digital media more generally. Frankly, if you create another version of last year's game, who is going to care or even notice? The students coming out of RIT who are very successful are the ones who were connected to a faculty member, or a club, or an affiliation that encouraged them to push themselves beyond the expectations of their degree programs. At the MAGIC Center, we try to match people with similar interests and offer them resources, experiences, and mentors. I don't think you can build a class that would teach those things. Grush: I know that the MAGIC Center crosses over all the disciplines and departments at the university. But is there a primary well where you are finding students who take advantage of the resources and opportunities available to them at the MAGIC Center? Phelps: Right now we're getting a fairly large number of students from computing, broadly defined — CS, games, software engineering. And we get a fair number of students from the arts — the art and design programs. Given the focus of MAGIC, that's not surprising. But as the word is trickling out about the resources, experiences, and mentors at the MAGIC Center, we're starting to get more fields represented, with people who have vision within other discipline areas and want to explore using technology to realize their ideas. Grush: Do you have to recruit or manage mentors? How do you approach administration in this context? Phelps: Right now, we say that "everything is a snowflake" — everything we're doing is for the first time. And that's good, because we always want to be "doing the new"; it's our mission after all. Still, we have hopes that at some point we will begin to establish reusable patterns. And we are starting to see some of these. What we do is still very much "one-off". So, you can't really categorize what we do as efficient. But as I've said before, some of what we do will eventually become a standard part of the university culture — and hopefully we will gain some efficiency from that. Grush: If you needed to identify an exemplary project you've done at MAGIC Spell Studios, what would that be? Phelps: One of the things that we did over the past 20 months, was to help students publish an Xbox game. 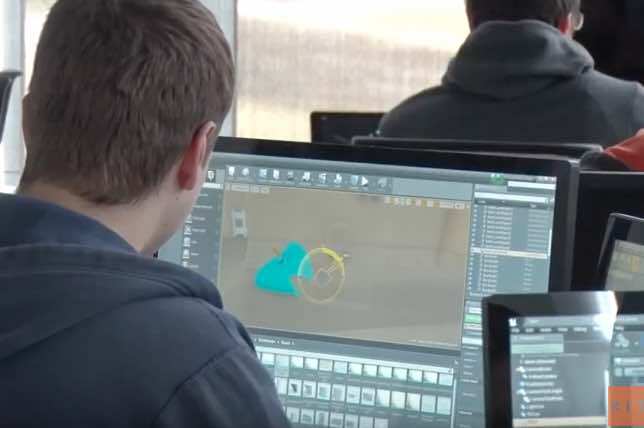 These were traditional computing and arts students who had taken classes that technically explained what they needed to know to make the game. But the experience of actually publishing the game was outside that curricular sphere. By resolving to publish, they had to deal with certifications on the platform; they had to deal with how we integrate with the store front; they had to deal with the marketing and doing a social media push around the launch… They worked with very specific issues like royalties and contracts. So, they gained a body of experiences that they would not have in their classroom instruction. Importantly, by making a real-world product, they have "run the gauntlet" in a way that you just can't mimic in the classroom. This is the core experiential piece that we are trying to bring to the table. Grush: What is one of your most current projects? 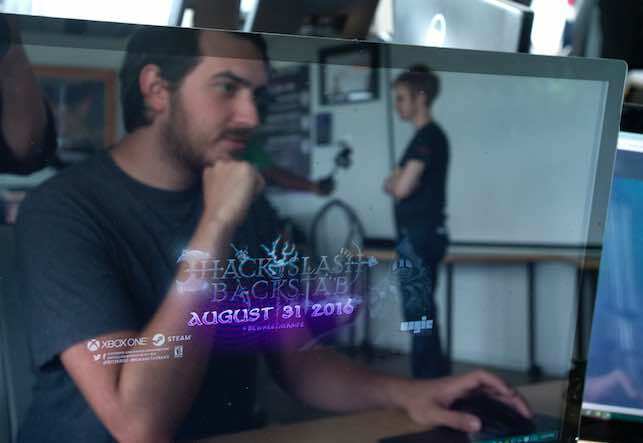 Phelps: Expanding on the idea of offering a genuine product production and publishing experience, just this past Friday we opened a statewide project called the Game Dev Challenge. As one of three Digital Gaming Hubs that include RIT, RPI, and NYU in the state of New York, we have built a linked ecosystem so that any student at a New York college or university, or any independent game developer in the state can propose a game development project, start working on their idea, and submit their work to the Game Dev Challenge between April 3 and April 24. There are some generous award purses (up to $25,000 in funding), but perhaps more important is the network of mentors and resources these developers can tap to get their idea moving on a "real-world" development trajectory, to engage with a community of developers, and to be a part of games development and the culture of creativity in the state of New York. Prizes will be announced the second week of May. But the ongoing, long goal of the project is to continue to develop the region and the state — with more game development, more media development, and more startups and related jobs. Grush: Looking at the entire ecosystem of higher education and what new opportunities may be possible for students now, could you pick a particular path or objective you feel is most important for MAGIC Spell Studios? Phelps: If I had to choose just one thing, I'd say it's being thoughtful and respectful, but challenging the status quo of "how we do things" at the university. This is a healthy thing for us, and for universities in general right now. When I first came to RIT many years ago, our graduates were going to get their first jobs, and keep them, possibly for their entire lives. No one graduating today is going to live in that world. Our current students will see several different jobs, and possibly several different careers over the course of their lifetime. How do we prepare them, for that? It's very different from preparing for what we used to think of as a career path. All of the hallmarks of an established university — like a broad-based liberal education — still resonate. But now, we can't ignore the speed at which change is happening, along with the roles of technology and community. At the MAGIC Center, we are on the ground trying to understand all this. We have to challenge "how we do things". And learn how to "do the new".